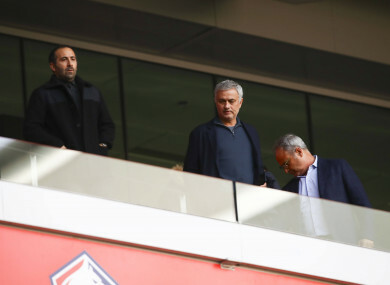 Jose Mourinho pictured at the Lille-Montpellier game. JOSE MOURINHO SAID he could see himself coaching in France as he attended Sunday’s 0-0 draw between Lille and Montpellier to reportedly cast an eye over Ivorian star Nicolas Pepe. Mourinho was sacked by Manchester United in December in a move that cost the Premier League club £19.6 million (€22.4 million) in severance pay for the Portuguese boss and members of his staff. Email “Jose Mourinho on scouting mission in France”. Feedback on “Jose Mourinho on scouting mission in France”.